Biden focuses on McCain, saying he was "dead wrong on Iraq"
Biden says McCain's proposed health care credit "ultimate bridge to nowhere"
(CNN) -- Sen. Joe Biden was debating Gov. Sarah Palin on Thursday night, but the Democratic vice presidential candidate known for attack-dog instincts saved his bites for Sen. John McCain. 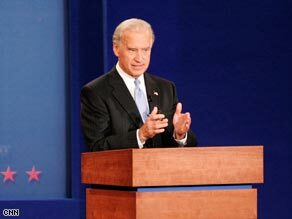 Sen. Joe Biden blamed some of the economic crisis on deregulation policies in which McCain believes. Biden spent much of the 90-minute vice presidential debate slamming McCain's stances on the economy and foreign policy, calling the GOP presidential candidate's proposed health care credit a "bridge to nowhere" and saying McCain has been "dead wrong on Iraq." Biden sought to link McCain to Bush administration policies and said the U.S. economic crisis is evidence that the country for the past eight years has had the "worst economic policy we ever had." He also blamed some of the crisis on deregulation policies in which McCain believes. "He voted for deregulation, and [deregulation] is why we are in the crisis that we are in," Biden said during the debate at Washington University in St. Louis, Missouri. Biden touted running mate Sen. Barack Obama's proposed tax breaks for the middle class and his goal of providing more access to affordable health insurance. He slammed McCain's proposed $5,000 tax credit for families who purchase their own health insurance, saying the average cost of insurance provided through employers is $12,000. "So you're going to ... replace a $12,000 plan with a $5,000 check you just give to the insurance company. I call that the ultimate bridge to nowhere," Biden said. The bridge comment -- a reference to an Alaskan project that Palin supported and then rejected -- was one of Biden's few digs at the Alaska governor. That's not to say he didn't counter her. After moderator Gwen Ifill asked about an exit strategy for the U.S. in Iraq, Palin said, "we do have a plan for withdrawal" and "we don't need early withdrawal out of Iraq" before saying that the troop surge there has worked and that "it would be a travesty if we quit now in Iraq." He said McCain was "dead wrong" about Iraq leading up to the war, alleging that the Arizona senator said that oil would pay for the conflict and that Sunni and Shiite Muslims got along with each other. "As my mother would say, God love him, but he's been dead wrong on the fundamental issues relating to the conduct of the war," Biden said. He said McCain "continues to tell us the central [front] on the [war] on terror is in Iraq." "I promise you, if an attack is going to come to the homeland, it's ... going to come from al Qaeda planning in the hills of Afghanistan and Pakistan. That's where they live," Biden said. When Palin tried to needle Biden, he often smiled it off and kept his focus on McCain or the Bush administration. When Palin alleged that Biden had said at one of his rallies that clean coal didn't exist, Biden responded briefly that his comment was taken out of context. Although Democrats have criticized Palin for a lack of political experience, Biden didn't approach the issue. When he talked about comparing his record with others, he didn't mention Palin. "I will place my record and Barack's record against John McCain's or anyone else in terms of fundamental accomplishments," he said. Biden said McCain wasn't a maverick on "the things that matter to people's lives," citing issues such as health care, education and the war. "He's not been a maverick on virtually anything that genuinely affects the things that people really talk about around their kitchen table," Biden said. Palin chided Biden and Obama for trying to link McCain to Bush, saying the Democrats were "constantly looking backwards, and pointing fingers, and doing the blame game." "Look, past is prologue," Biden responded. "The issue is, how different is John McCain's policy going to be than George Bush's? I haven't heard anything yet."